"One night just wasn't enough to enjoy your stunning property and generous hospitality. We will be back". "Wonderful hosts - very accommodating. Pleasure to enjoy your home". "Beautiful property. Great hosts. Definitely a place to return. Fabulous time. We will be back. A huge thank you." "Really enjoyed my 3 week stay. Very peaceful surrounds with amazing gardens, Awesome breafasts and even better hosts". "Very clean. Great hosts. Comfy bed". "Thank you, Trevor, Joan & Emma for making our first BnB experence just lovely. So welcoming & lovely. Couldn't fault a thing! 10/10." "Came for daughter's pre wedding eve - wonderful hosts, comfortable beds, thoroughly enjoyable. Thank you". "Bridesmaid to best friend - pre wedding night. Thank you for looking after us". "Bride - beautiful place to spend what's a beautiful day!! Thank you!! "Bridesmaid - gorgeous property plus lovely place to get ready and photos. Thank you". "Thanks for a lovely break, Trevor & Joan. Lovely time. Thanks". "Beautiful home and in a great location too. You're both excellent hosts (and chefs). Hopefully, next time is a longer stay". "Such a beautiful BnB. Loved the glorious garden, delightful rooms, fantastic breakfast and warm hosts, Joan & Trevor". "Lovely place!! Great hosts! We really enjoyed being here. Wonderful experience. We will definitely be back". "Thank you, Trevor & Joan for your wonderful hospitality and beautiful location". "We loved the bike riding, quiet place and big beds and especially movie theatre. Thank you". "Lovely hosts & awesome breakfast. Having the car pick us up to and from wedding was so convenient. Overall we had an amazing stay and we'd definitely come back if in the area. Thank you so much". "Lovely place. Hope to come again". "Sensational placeto relax, Beautiful beds and pillows. Host very welcoming. Hope to stay again soon". Cameron extended family, Cavendish Vic. "Thank you for a lovely stay- bed, house, hosts & food all wonderful.Especially enjoyed watching the cute chooks rummaging in the garden". Ross & Vicki, Woolongong NSW. "Thank you for having us. It's a beautiful home. The hospitality was fantastic. Your property is incredible. Thank you for being so lovely and welcoming". "Thanks for the last week and a bit - very comfortable stay. The place is spot on". "Thank you, Joan & Trevor for a very pleasant 6 days. Studio apartment is top class. Love it"! "Such a lovely home. Nice warm fireplace, beautiful sun on our backs in alfresco dining. Breakfast was beautiful. Yum! Thank you for your hospitality. We had a wonderful stay with the kids". Three mums with their 3 year olds visiting Fairy Park from Melbourne. "The footy disappointment more than offset by the wonderful accommodation and company. 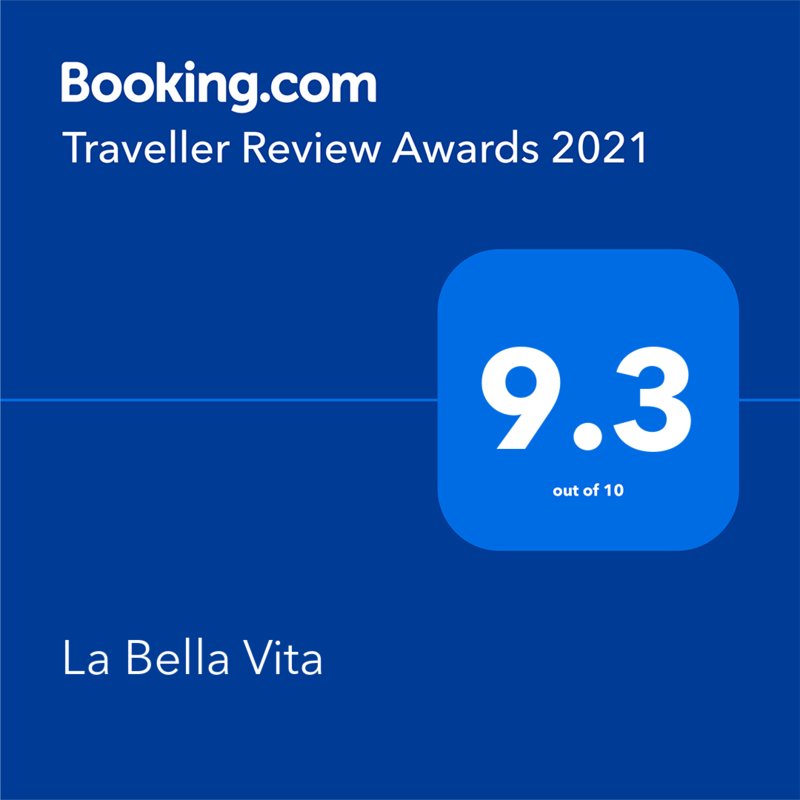 No difficulty in recommending La Bella Vita! Love this place. Totally impressed - great accommodation and hosts". Four Crows Supporters from Adelaide. "In Batesford for a wedding. Our first BnB experience. Joan & Trevor are great hosts & a lovely welcoming homely place. B & S Lawn, Adelaide. "Thanks for the nice accommodation and for booking the restaurant. Merci beaucoup". C & Y Lutsen, Paris. "Thank you for a lovely stay". S & G Peters, Inverloch. "Very nice accommodation, comfy bed. We enjoyed our stay & exploring the area. Pleasure to meet you both". "Lovely accommodation & surrounds. Very friendly hosts. Thank you". "We were spoilt and spent a couple of days in the self contained apartment. So relaxing and still having Joan and Trevor close by for anything extra we may have needed". G & T Anderson, Melbourne. "Joan was really accommodating and Trevor cooked very good breakfast for 7. Had a good sleep, despite the super cold weather. Would definitely come back again". "Beautiful mansion! Thank you for the lovely stay". P & M Thang, Malaysia. "Thanks- enjoyed our peaceful stay. So welcoming and hospitable. We all felt special and spoilt. Delicious breakfast. Great fun with Tom! Super comfy beds. Thank you so much for such a relaxing stay. Be back soon". "Thanks, Joan and Trevor for the nice stay. The house is really cosy and the bed hugely awaiting. Hopefully we will be back soon". "Thank you for your help and everything". M. Assiri Group, Saudi Arabia. "Joan, Tom, Trevor, thank you for going the extra mile". "Thank you for a wonderful stay once again. Lovely hospitality& breakfast. The chooks & Tom provided great entertainment". "Nice stay, nice breakfast and super sleep. Very quiet & comfortable - high standard "A Hidden Gem". "Felt at home as soon as we arrived. Could not fault the amazing service and beautiful accommodation. Our 3 year old wants to move in! Will definitely be back". "Many thanks to our great hosts who made our stay here like a second home. Comfy bed and breakie. Would recommend it to anyone. Many thanks again". "We are so happy to stay in this wonderful house". "Warm & welcoming hosts from 'get go'. Beautiful property, studio and home. Thank you for having us, Joan and Trevor. Our 1st BnB experience has exceeded expectations." A & J Voss, Doreen, Vic. "Thank you, Joan and Trevor. We felt very at home. Wonderful experience for our first BnB. Would definitely stay again. Fantastic"!! "Thoroughly enjoyed our stay - so relaxing and wonderful hosts. Only disappointment is that we only stayed one night. We will be back". "The best night. Enjoyed it thoroughly, beautiful rooms, lovely people to meet and stay. Highly recommend our stay". "Wonderful two night stay. Breakie amazing. Super comfy bed. Best night's sleep in Melbourne. Country but close to Geelong city. LOVED IT! Great hosts. We will be coming back". V & B Raftis, Mandurah WA. "Amazing property - LOVE, LOVE, LOVE the alfresco with the fire. Very welcoming hosts. Thank you, Joan and Trevor for spoiling us. Daughter loved the animals and said she felt like she was living in a beautiful country PALACE. We had a great stay. Thank you". "Best wishes for everything, always love the light of love. Very beautiful house". "Thank you for making our little weekend away so lovely. What amazing gardens and property". "Thanks for great hospitality. Need to come back again sometime"
"Very, very friendly hosts and Tom! Wonderful garden and breakie. Thank you for taking us for a walk in your property and for showing us Tom"s friends and horse. The beds and pillows is very soft that we have a nice sleep. All the best". "Thank you for a wonderful and refreshing stay. It would have been lovely to have a longer stay - next time". "Perfect overnight stay with very friendly hosts, puppy and chickens. Lovely stay, thank you. Definitely will recommend to family & friends". "Excellent hospitality and fantastic rooms! Probably the most comfortable bed I have ever slept in". "Really a big and splendid house. The house is decorated in a cozy style and we have a very nice day". "Very pleasant stay, outstanding suite, lovely hosts and good breakfast!!! SHALOM, and goodbye." H & A Blum, Israel. "Thank you for the hospitality. Everything is just fine and will certainly come again next time". "Beautiful property & exquisitely maintained. Extremely warm and welcoming hosts. Thank you". "It was great and comfortable to stay. Very relaxing". C & H Segat, Melbourne. "Very good experience here. Very beautiful house. Very beautiful lady. Very wonderful day here. Thank you for a perfect stay here to be with you". "Joan & Trevor, what an amazing home you have. We felt very welcome and slept like babies. Would thoroughly recommend you". T & N Williamson, Melbourne. "Thank you for going out of your way to make us feel comfortable and stay pleasant. Beautiful property"! "Beautiful home and gardens. Thank you for your help at our wedding. The breakfast was delicious. Superb find! Wonderful property for a wedding". Patterson Wedding held at La Bella Vita. "Thanks very much. We like your hospitality, garden toooo much. We would like to come again. Thanks very much. "Thank you for the beautiful hospitality. We had a lovely relaxing stay. We would 100 percent recommend your accommodation to others". "The accommodation was beautiful and the beds were great - such a homely feel and really enjoyed watching a movie on the projector. Will definitely keep it in mind for a night away with my husband". "Thank you for a wonderful relaxing stay. The homely stay and friendly hospitality made it very memorable!! Would definitely tell others about it". A. Seaborn (girls night away). "Thank you for a lovely stay. Home and hospitality were both exceptional". "Thank you for your diligent hospitality & transport. 2nd, of course, the incredible cooked breakfast". A & S Parry & friends. "Thank you for the very hospitable stay. Beds were extremely comfortable and the breakfast was incredible. Close proximity to Harrison Estate which was very convenient for a wedding. Thanks again". "Garden is very comfortable. Every meal is full of your love. We saw lots of animals, picturesque views. We love Tom! Thank you very much. Look forward to coming again". Z Shijie & family, China. "What a memorable weekend. Thank you Joan and Trevor for helping it to be fun and relaxing as it was. Will be back". T. Cleary Group, Blue Mountains, NSW. "Very spacious and beautiful home with gracious hosts. Thank you for a lovely weekend". "Lovely apartment, lovely bed, lovely grounds. Thank you"! "What a great stay! Perfect for us the night before we attend a wedding at Bells Beach. Wish we could have stayed longer - next time". R & E Kemp, Canberra. "Thanks for the lovely weekend stay. Lovely breakfast cooked by Trevor. We're looking forward to seeing you next time". "What an absolutely beautiful place to stay. Thank you to Joan and Trevor, wonderful hosts and a great breakfast. Your BnB is absolutely stunning. Highly recommend it"! "What a lovely place to stay! The bed is so comfy. Wish I could stay here longer. Highly recommend this place. Thanks for the breakfast". "Wonderful!! Great sleep. Fantastic breakfast. So comfortable. Highly recommend". "What a lovely family! What a wonderful place and what a wonderful and unforgettable day that we stay here. Congratulations, hosts"! J & J Salinas, Spain. "Spectacular food, views, comfort and hospitality. Gardens are magnificent. What a piece of paradise! Thank you, Joan and Trevor. Hope to return again one day". Three teachers from Wagga Wagga, NSW. "Unfortunately only a short stay but enjoyed it. Looking forward to coming back. Thank you." "Great hospitality. Great bed - nice sleep. Merci Beaucoup"! D & B. Hermans, Belgium. "Beautiful place, very comfy bed, awesome breakfast. Thank you for Joan's recommendations on places to visit. C & S Yim, Hong Kong. "Hospitality very good. Great accommodation. Found by accident - would come again. Fantastic garden". "Great hospitality, great bed and superb breakfast. Will certainly stay again". "Beautiful property, great hospitality and very relaxing. Would visit again". "Good breakfast and super rooms! Thank you for sharing with us". Super comfy beds. Best dog ever, very fair at playing pool. Thank you. Six Melbourne wedding guests attending nearby winery wedding. Beautful property and wonderful hospitality to match! Had a lovely breakfast and thoroughly enjoyed the company of Tom. Thank you. Megan and Beau, NSW. Bella Vita s/c apartment has been the perfect place to stay for the past 2 months. Comfortable, peaceful and private which has been important for work commitments. Great host. Thanks, Joan. Regional Bank Manager transferring to Geelong.